Make the dressing: in a bowl, whisk together the mustard and vinegar, then slowly whisk in the oil, until dressing is emulsified. Add a little salt and pepper to taste. In a salad bowl, mix arugula with fresh and dried cherries, feta cheese, onion if you’re using it, and as much dressing as you like. Put the salad on plates, sprinkle with toasted almonds and serve. *To toast the almonds, put them on a baking sheet, in a 350 degree oven for 10-15 minutes, or until they start to smell fabulous. Variations: Add some grilled chicken and you’ve got a meal. Add some sliced Belgian endive and you’ve got even more of a meal. This entry was posted on Monday, June 30th, 2008 at 10:33 am	and is filed under Recipes, Salad Days. You can follow any responses to this entry through the RSS 2.0 feed. You can leave a response, or trackback from your own site. Cherries, feta and onions. Whodda thunk? Definitely will try. Did a plate of mangoes and French feta from the Persaion market which was quite a success. On to cherries! I am a woman that relies on her husband to cook. Those Layers are good cooks, but the other night I made your roasted chicken and they all loved it and then I told my girls, ages 7 and 8 and who are huge fans, that YOU gave me the recipe. 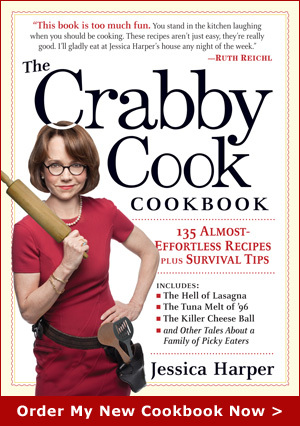 They think I am so COOL that Jessica Harper gave me the recipe. Good thing Uncle Charlie is a relative or they would think I am lying. I will try this recipe out soon and let them think that you and I are really swapping recipes via emailâ€¦â€¦â€¦I LOVE your blog~ Someday we will all meet and my girls will really believe that Uncle Charlie knows you. Thanks again for the recipes. It is fun to make things when I have your name to back them up. Hope you are doing well, Jessica! Very cool blog, I am going to make this recipe. 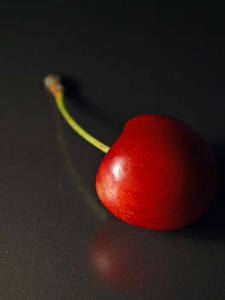 Very unusual and I love cherries. I just befriended you on twitter too.